Fermentation and maceration in stainless steel tanks at a controlled temperature of 24°C-27°C (75.2°-80.6°F) with 14‐16 days of skin contact and daily pumping over. 18 months in 500 lt tonneaux 30% new and 70% of second passage. Colledilà is one of the most representative wines of the terroir of Brolio. The vineyard is situated at 380 meters above sea level on southeast, southwest facing slopes, in the most beautiful and representative part of the estate. The hillside is part of the geological formation, Monte Morello. Calcareous clay soil, rocky, rich in calcium carbonate and clay with little organic matter, the soil is well drained and very stony featuring average water-holding capacity. The growing season 2014/2015 was quite regular without extreme events. Winter was mild with temperatures falling to freezing only at the end of December and in January and February. Spring was also regular. Although a little cold at the beginning, temperatures began to rise and were average afterwards. May and June were warm favoring a perfect flowering and veraison. Rainfall was not excessive, about 150 mm. Summer began earlier, with high temperatures already at the end of June when we recorded peaks of even 34‐35 °C (93.2‐95°F). July was also particularly warm, above all in the first decade, with peaks of even 40°C (104°F). Rainfall was scarce (about 100 mm, but the good water supplies during the winter and spring months prevented drought stress. September and October showed perfect weather conditions, with significant day‐to‐night temperature ranges, favoring the accumulation of color and polyphenols in the grapes. Ruby red color. Complex and intense bouquet of ripe red fruit, plums and flower scents. The entry is velvety and generous with delicate tannins. The fine texture and well-balanced acidity give the wine a long persistence on the nose and palate. 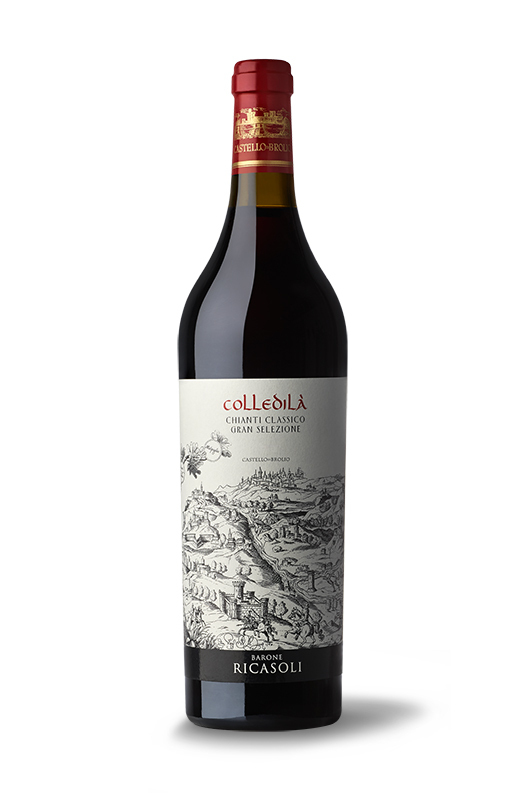 Colledilà is one of the most representative wines of the terroir of Brolio.